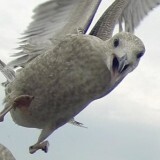 Plymouth Herald journalists Charlotte Turner and Jon Bishop say they have fallen victim to a gang of gulls in Plymouth. The pair are among a number of victims of the birds to have come forward to The Herald in recent weeks, with many attacks taking place on the city’s New George Street. The newspaper reported on seven-year-old Thomas West, who was rushed to hospital and left bloodied after being attacked by a gull while eating a doughnut in the street. Charlotte, who serves as health reporter for both The Herald and Western Morning News, was targeted at the same spot by a bird which landed on her shoulder before stealing a cheeseburger she was eating. Jon, a video journalist, added that he was attacked outside a McDonald’s restaurant, where a seagull hit him on the back of the head. Plymouth Sutton & Devonport MP Oliver Colvile has recently led a call for action on the birds in Parliament, warning of ‘gull wars’ to come and demanding the installation of ‘anti-seagull spikes’ to protect the public. Rest assured gulls aren’t highly attuned enough to be able to conduct personal vendettas against individuals, they’re simply an everyday occurrence in any coastal seaside town,part and parcel of coastal living. Surely there are more relevant and pressing matters to be investigated by the local papers in this part of the west? I assume none of this was set up for this seasonal ‘seagull ate my burger’ nonsense? I must be getting too sceptical in my old age and in a world of ‘fake news’ and spin. Great journalism guys, no really! There’s a common theme here and it’s not vindictive seagulls, its food being eaten on the street. Gulls are scavengers as, I would hope, any self respecting journalist based in a coastal town or port world know, the people being targeted were all eating fast food in an area with a high number of fast food outlets. anyone else find the prospect of a’heanth reporter’ eating cheeseburgers ironic ? Could someone please explain how seagulls are able to ‘identify’ journalists in order to attack them? Back in December last year this paper urged its staff to get out and about to find news stories, presumably things are so quiet there this is the best they could come up with? The MP surely has better issues to raise on behalf of his constituents too than this non story which if he’s that concerned can rectify locally without recourse to parliament.